About this site - Can you help? The TI-59 was the first "real" programmable calculator in the world - you could actually use it to perform some useful work, like solving the system of linear equation, finding the zero of a function or even playing a Hi-Lo game... or the game of chess. Fantastic 960 program steps (nearly 1 kilobyte of RAM), 100 data registers, a variety of built-in functions... it was a dream machine, a personal computer you could afford during the late 1970s. 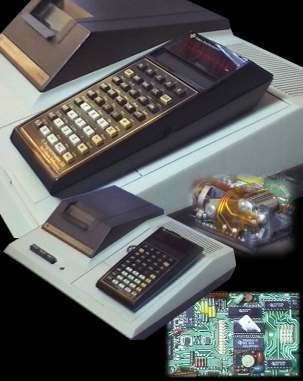 The TI-59 even had peripherals - magnetic cards to save programs, a variety of solid-state ROM modules containing up to 5000 program steps of (mostly engineering) software and a PC100C printer. In the old days, amateur programming was "the way to do things", so hundreds of TI-59 owners spent countless hours uncovering TI-59 secrets and writing miraculously optimized programs - saving a single program step (one byte) sometimes took an hour of work. TI-59 programs were distributed via numerous user clubs, and there was a number of TI-59 related publications. Although hardly anybody actually uses the TI-59 nowadays, accomplishments of TI-59 programmers deserve to be remembered. This Web site is dedicated to the good old days when people thought that each byte of program memory was important and when computers were truly personal.